Lot:6016 Fishers, Indiana. 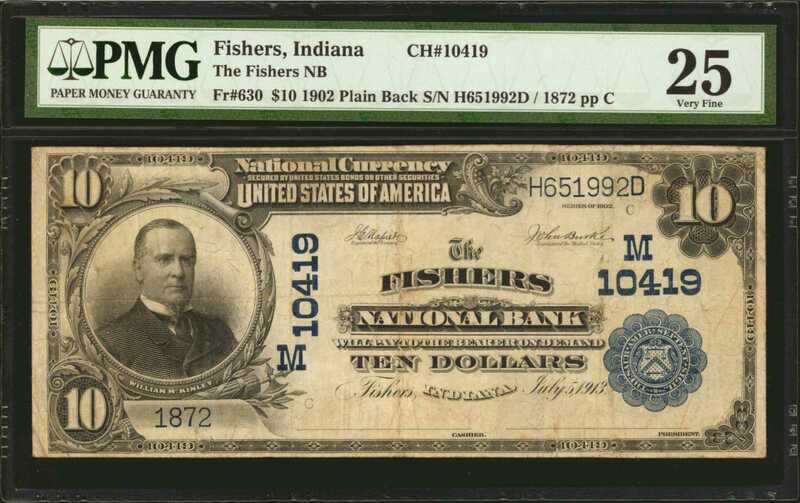 $10 1902 Plain Back. Fr. 630. The Fishers NB. Charter #10419. PMG Very Fine 25. Fishers, Indiana. $10 1902 Plain Back. Fr. 630. The Fishers NB. Charter #10419. PMG Very Fine 25.While eight large are reported, this is just the second example to sell in nearly 23 years. The signatures are a bit faded but the overall quality of the note is justified by the grade.